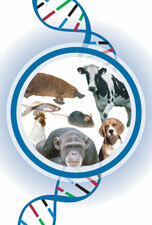 Genetics is the branch of biology that studies heredity and trait variation in organisms. It is concerned with how particular qualities or traits are transmitted from parents to offspring, and the molecular basis of those traits. Geneticists study genetic material (DNA) and mechanisms in attempt to determine how genes are related to variations of inherited characteristics among related or similar organisms. This page was last modified on 27 August 2013, at 10:48.